Church Action on Poverty unveiled the newest phase of the Government’s GREAT campaign, launched today. 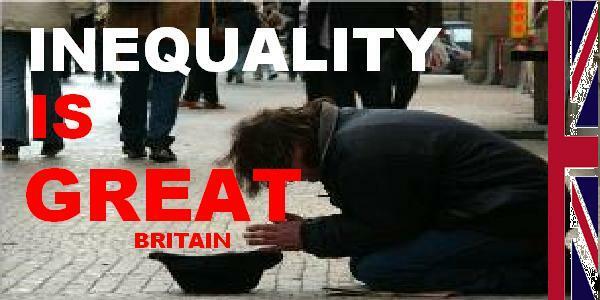 INEQUALITY IS GREAT BRITAIN is Church Action on Poverty’s contribution to the Government’s Britain is Great campaign – showing off the best of British to the world. Plans to launch the campaign with the simultaneous unveiling of billboards in Britain’s richest and poorest neighbourhoods: Easterhouse, Glasgow (male life expectancy 73.1 years) and Kensington and Chelsea, London (male life expectancy 84.4 years) were ruled out, but posters have been launched on Facebook and Twitter. The campaign was launched to mark the fact that income inequality in the UK – the gap between rich and poor – is greater now than at any point in the past 50 years (in fact, since figures were first collected, in 1961).